As mentioned in a previous post, iterators in Scala, such as foreach, for & while loop have different performance characteristics. 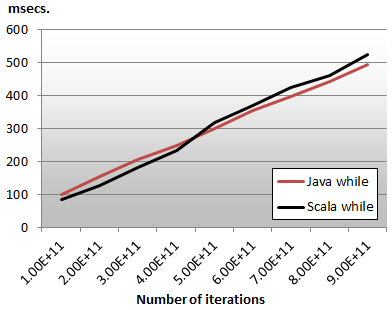 A recurrent question between developers is the relative performance of Scala and Java regarding for and while. The "for comprehension" closure in Scala is indeed a syntactic sugar wraps around a sequence of flatMap and map methods. Monad in Practice. It is expected to be significantly slower and should not be used as an iterator. We select the higher method foreach to implement the for iterator in Scala. The simple evaluation consists of processing a large number of iterations of a very simple statement which execution does not interfere with the actual performance of the iterator. The code is also is easy to understand. The code for the while loop is described below. The test is executed on a 4 cores Intel i7 CPU with java 1.7.02 64-bit and Scala 2.10.2. 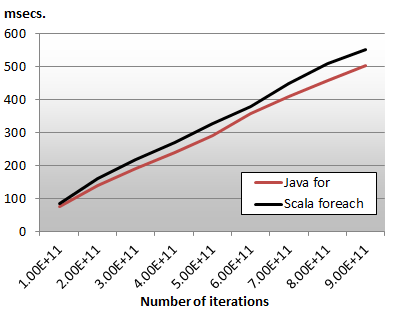 The chart below, compares the duration of the execution of the for iterator for Java and Scala. 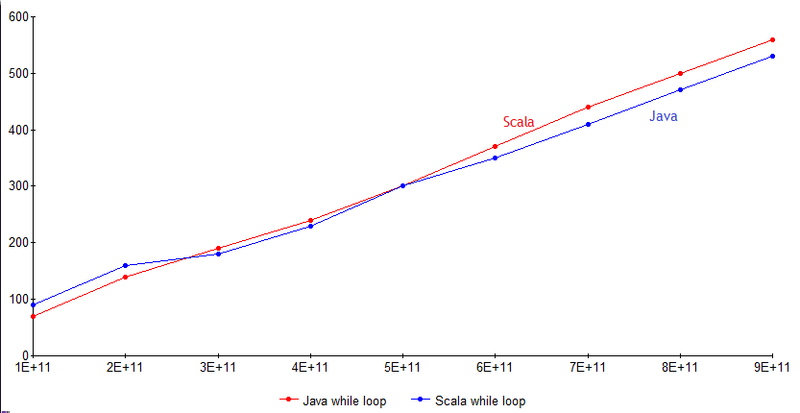 The performance of Scala and Java for executing the while loop are very similar. 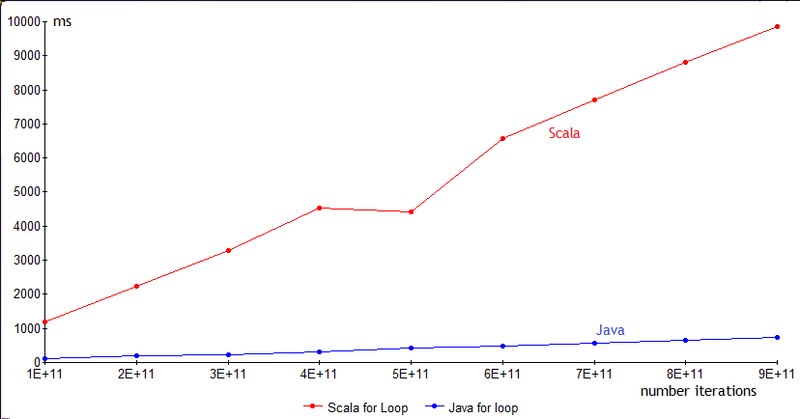 The second test consists of comparing the relative performance of Java for loop and Scala foreach higher order method. The first step is to analyze the number of byte-code instructions generated by the Scala compiler. We use the Java Class File Disassembler, javap, to print out the actual instructions processed by the Java virtual machine. The sequence of instructions generated for the execution of the while loops are displayed below. - ultimately the foreach method is invoked to execute the loop. Interestingly enough, the foreach method for collection is implemented using the while loop not the for loop. 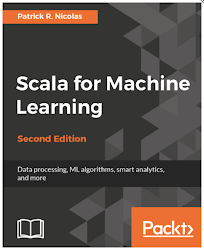 Scala compiler plug-in such as ScalaCL to optimize the execution of iteration on Scala collections, Arrays, Lists,... have been introduced to get around this issue. The reader can also take comfort in using the Java Class File Dissambler to understand how a method or piece of code translate into efficient, or in our case, inefficient byte-code. Quite a few methods in Scala such as foldLeft, reduceLeft uses tail recursion to traverse collections. It would be interesting to compare the relative performance of those methods with alternatives using iterators.. stay tune.